Over the next few days, I will be writing about different subjects that were discussed at Mid-Winter. From Sunday through Wednesday, I was able to hear about topics ranging from school finance and accountability to school safety. I will try to share as much information as possible about each topic. Today, I will talk about the pre-conference meeting that I attended. The Equity Center sponsored a special, pre-conference meeting on Sunday. During that meeting, we heard from state legislators, school finance experts, and all of the lawyers representing the various groups in the school finance lawsuit. State Senator Kel Seliger and State Representative Jimmie Don Aycock led off the session by giving their views on school finance and changes that they will be proposing in our state testing and accountability system. Senator Seliger has introduced Senate Bill 225 for consideration in the senate. Representative Aycock states that similar legislation will be introduced in the house. In Senate Bill 225, the graduation plans for high school are completely reworked. Instead of the current system of minimum, recommended, and distinguished achievement, the new system would have a foundation program with endorsements in areas such as science, technology, and math (STEM) and career and technology (CATE), The STAAR testing at the high school level would see changes. The number of end of course tests counting for graduation would decrease from the current 15 to 5. However the other 10 tests would still be given. It would be up to the district on how to utilize these tests. Representative Aycock voiced overall support for the majority of Senate Bill 225; however, he stated that he would like to see a permanent reduction in the number of end of course tests. Representative Aycock stated that he believed the hot topics for this session included: testing and accountability, reduction in the end of course tests, a push for more career and technology options, and a move away from the idea that you can only be as good as your lowest subgroup in accountability. Representative Aycock also stated that he was much more optimistic this session with regards to school finance. We also heard from former state judge F. Scott McCown. Mr. McCown was not nearly as optimistic on school funding. He believes that there will not be any extra money available to put back into education to offset the $5.4 billion in cuts from the last legislative session. He also believes that there will be little or no action on school finance until after the final ruling on the school finance lawsuit. He sees a final ruling from the Texas Supreme Court taking place in the fall of 2013. He also stated that the ruling might give the legislature the room to wait until the 2015 legislative session in order to address the issue. Mr. McCown believes that the court will find something that is a catalyst for legislative action. One of Mr. McCown major points is the need for the modernization of the tax system in Texas. He maintains that as a state, we cannot continue to rely on the sales tax. Next, we heard from the Executive Director of the Equity Center, Dr. Wayne Pierce, and school finance expert Lynn Moak. Mr. Moak seemed more optimistic about state revenues and the possible funding of public education. Dr. Pierce continued to offer examples of how inequities permeate our current system of financing. Finally, we heard from all of the attorneys representing all of the groups that have entered into the school finance lawsuit. It was interesting to hear that, overall, the sides have all worked well together, and have cooperated throughout the trial. It was also interesting to hear that while all the groups considered the current system inadequate (not enough overall money in the system), not all the groups viewed the system as inequitable. The group representing the wealthier districts in the state made no claim that the system was inequitable, and according to some attorneys, actually worked against equity claims of the other groups. Looking for a unique way to help teach Inference? Here is a great Pinterest board…Inference with Pictures! As you can see the pictures ask what you think may have happened and then ask that you defend your answer by acquiring evidence from the photo. These photos can be used as daily starters, reteaching resources, or even reinforcement. 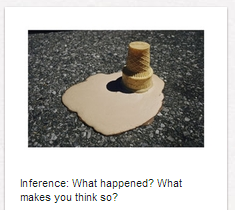 Inference with Pictures also offers Tips for Teaching Inference from Minds In Bloom. It is worth checking out. general studies, which would be a combination of other endorsements. students subject to the current graduation plans under certain circumstances. Regarding end-of-course exams (EOC exams), the bill maintains the current administration of all 15 EOC exams, but only requires that five be required for graduation: Algebra I, English III, biology, and United States history. The bill would also allow four-year colleges and universities to admit students who graduate under the new Foundation Program. Sen. Leticia Van de Putte (D-San Antonio) and Rep. Diane Patrick (R-Arlington) today filed companion bills that would make substantial changes to the state’s testing and accountability system. SB 240/HB 640 eliminates the 15 percent rule, reduces the number of end-of-course exams from 15 to 3, eliminates the cumulative score calculation, infuses testing alternatives such as SAT and ACT exams, suspends 2012-13 state accountability ratings, and prohibits the use of end-of-course exams for student class rank or admission into a Texas college. The “Texas School District Security Act” provides for a dedicated sales tax (if available under the state cap), or a dedicated property tax specifically for crime control and enhanced security based on local school district needs. The revenue generated from a local option School District Security Fund would be separate from all other district funding. I am hopeful that these bills will cause a general discussion about testing and the overall accountability system. I certainly think that there exists a place in education for good tests that measure a student’s learning and that can provide good information to the student, parents, and teachers about that learning. At the same time, I have been and continue to be a proponent for utilizing quality tests that are already in existence. The SAT and ACT tests have been around for decades. To me, there is no sense in trying to reinvent the wheel to come up with measures of college readiness. These tests are there and could be easily utilized by all of our students. I am pleased that the topic of school safety is at the forefront of this legislative session. Again, I hope that many different avenues are explored by our representatives and senators to provide the best protection for our children. I think that the introduction of the “Texas School District Security Act” is a start. As it is now, this bill would give residents of a school district, by virtue of property taxes, the option of voting to raise additional funds solely for the purpose of security measures. While this is a step in the right direction, I hope that our legislators come to realize that a district should not be limited simply by the property wealth that is contained within its borders. As with other school finance issues, a district with higher property values is going to be able to generate more funds than a district with lower property values. EISD was recently contacted about hosting a flu shot clinic for staff and community members. While the district has already hosted one such clinic for staff members, we had not had one that included the community. With the widespread outbreak of flu, we wanted to take this opportunity to provide this service to our staff and community. HealthMatters will be here this Thursday, January 24, from 7:30 AM – 8:30 AM to offer flu shots for our staff and community members. The clinic will be held at the Middle School. The cost of the flu shot is $20. Everyone is invited to take advantage of this opportunity. Please help me get the word out to everyone about the flu shots. I want to congratulate senior power lifter Casey Bramblitt on her recent 1st place finish at the Van Powerlifting Meet. Last year, Casey qualified for the state powerlifting meet. At the state meet, she lifted a total of 785 pounds (the total amount is taken from the maximum amount successfully lifted in squat, dead lift, and bench press). Last Saturday in Van, Casey had lifts of 335 lbs in squat, 165 lbs in bench, and a dead lift of 340 lbs for a total of 840 lbs! Prior to that, Casey also won the Forney meet with a total lift of 810 lbs. Casey has already topped her best from last year and has improved by 30 lbs from the Forney meet to the Van meet. Powerlifting workouts are done after all the regular workouts are finished. There is a lot of hard work put in to not only get stronger, but to make sure that they are lifting with the proper form. Casey and all the powerlifters are working hard to get better each day. If you have been by the softball/baseball fields recently, you have seen the work that has been completed on dugouts and backstops. Yesterday, the backstop nets were installed. The roofs on the dugouts should be completed this week. Along with the roofs, there are some doors that need to be installed and some wiring that needs to be done to the dugouts. After that, it is just a matter of our maintenance staff reinstalling the bases, reinstalling some fences, and doing some cleanup work. Both fields should be ready to go for the first practices. If you have a chance, please stop by and take a look at the new facilities. Please feel free to walk around both fields. Tonight, the High School basketball teams will be traveling to Malakoff for a district game. The games are scheduled to start at 4:30. I received an email from the Equity Center that the judge involved in the school lawsuit on state funding is expecting to have a ruling on the case by February 4. As you recall, EISD has been a member of the Texas Taxpayer and Student Fairness Coalition from the beginning. The court case has been ongoing since October. There have been many expert witnesses called on both sides. Further information will be passed on as it becomes available.